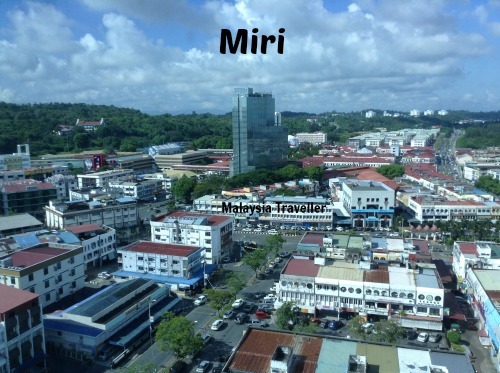 I have compiled this list of Top Sarawak Attractions based on my travels and extensive research. It is probably the most comprehensive list you can find on the internet. Sarawak is Malaysia's largest state with an area of 124,000 sq.km. but with a population of only 2.5 million made up of a multicultural mix of 27 ethnic groups. Despite the state's vastness and inaccessibility, it is much easier than it used to be to get around. In 1960 there were less than 500km of sealed roads in the whole state but now there are over 11,000km. All the major towns have their own airports while boat services on the state's 55 navigable rivers are still the only way to access many inland and remote rural areas. Forest cover is said to extend to 84% of Sarawak's land area but rainforests are under threat from logging, agriculture, plantations and development. Around 5% of Sarawak's land area is classified as Totally Protected Areas, comprising 25 national Parks, 8 Nature Reserves and 4 Wildlife Sanctuaries. Sarawak is a biodiversity hotspot and its forests, caves, wildlife, mountains and beaches are its main attractions. On this website, it is my policy to only write about places that I have visited personally but I am making an exception for Sarawak due to its size. So far I have only visited the areas around Kuching, Limbang and Miri but I feel there is a need to create a comprehensive list of Top Sarawak Attractions for those intrepid travellers who would like to explore further afield. On this map of Top Sarawak Attractions I have tried to place the marker points as accurately as possible for those places I have visited but some marker locations are rough estimates only and should not be relied upon without double checking. Kuching is an interesting city with a colourful history. Its heritage buildings include stunning Chinese temples, mosques, colonial era buildings, vibrant street markets and bazaars, museums and plenty of cat statues (Kuching meaning 'cat'). Cover the main sights using my Kuching City Highlights Walk. 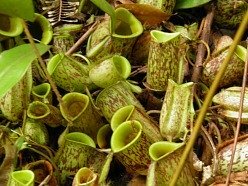 This is one of the smallest national parks in Sarawak but one of the most interesting, containing a wide variety of vegetation and terrains which can be accessed by a well-maintained network of nature trails. It is only 37 km from Kuching. There are some fine beaches here too - Telok Sibur, Telok Pandan Besar and Telok Pandan Kecil among them. Bako Sea Stack is a much photographed unusual rock formation jutting out of the sea. You need to hire a boat to access it. You can read about my trip to Bako Bational Park here. The park includes four jungle-clad mountain peaks, dense primary rainforest, crystal clear streams and waterfalls and is one of the best places in Malaysia to find the giant Rafflesia flower. The park is easily accessible from Kuching on a day trip. Another easily accessible park, just 22km from Kuching, is Kubah National Park. 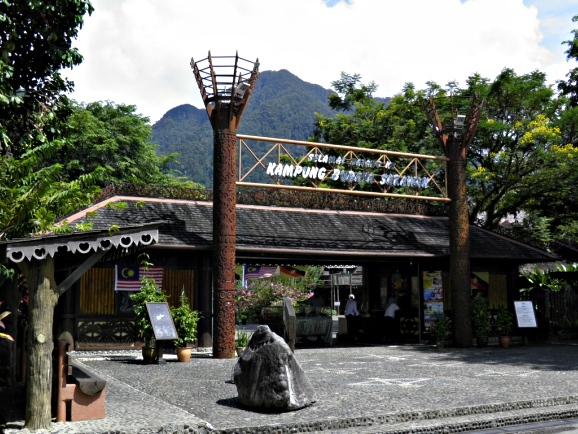 It contains three sandstone peaks, the highest of which, Gunung Serapi (911m), takes 3-3 1/2 hours to reach the summit where a viewing platform provides great views on a clear day. 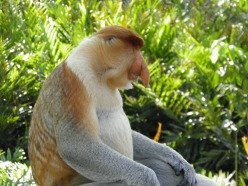 The Matang Wildlife Centre is located nearby. Tanjung Datu is one of Sarawak’s smallest National Parks with an area of just 14 sq km. There is no road access to Tanjung Datu so independent travel to the park may be difficult. For those few who make the effort, pristine beaches, stretches of coral and unspoilt rainforest await. Talang-Satang is a marine park established with the primary aim of conserving Sarawak’s marine turtle population. The park comprises the coastline and sea surrounding four islands of the southwest coast of Sarawak; Pulau Talang Besar (Greater Talang Island) and Pulau Talang Kecil (Lesser Talang Island) off Sematan, and Pulau Satang Besar (Greater Satang Island) and Pulau Satang Kecil (Lesser Satang Island) off Santubong, near Kuching. These four “Turtle Islands” are responsible for 95% of all the turtle landings in Sarawak. Pulau Satang Besar is a 30-minute boat ride from Damai Beach, Sarawak Boat Club Jetty or Telaga Air Jetty. There is no regular boat service and visitors should travel in an organised tour. Batang Ai National Park is part of a wider protected area covering adjoining regions in Sarawak and neighbouring Indonesia. It is a rainforest and wildlife conservation area and one of the few remaining areas where orangutans are found in the wild. Batang Ai National Park is the only part of this area open to visitors. Access is by motorized traditional longboat from the Hilton Batang Ai jetty or the Batang Ai public jetty. There is no public longboat service and transport should be arranged in advance. 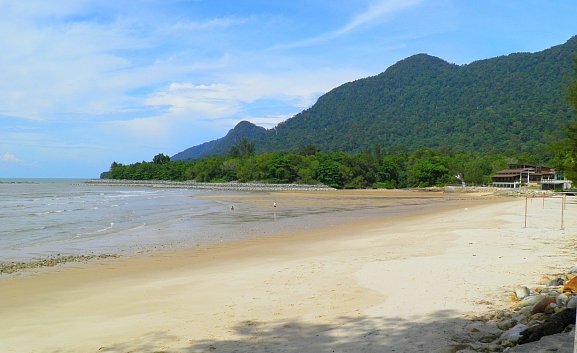 Similajau features a stretch of fine beaches with clear water suitable for swimming, especially during the dry season (February to October).The park is located 30 km north-east of the town of Bintulu. It gets busy at weekends but is fairly empty at other times. This is probably Sarawak's number one natural attraction. Gunung Mulu National is a UNESCO World Heritage Site including the world's biggest caves, trekking (including the famous Pinnacles trail), canopy walks, and pristine rainforest. The park is not accessible by road and requires a short (and relatively expensive) flight from Miri to Mulu. Another great location for cavers, Niah contains a vast cave complex swarming with bats and swiftlets with ancient cave paintings and archaeological remains. The majestic rainforest is criss-crossed with walking trails. The park is located a couple of hours drive from Miri town. Lambir Hills National Park is thought to be one of the world’s most diverse forest eco-systems with a wide variety of plant, bird, insect, reptile and animal species. The park is also known for its waterfalls (including Latuk Waterfall and Tengkorong Waterfall). Lambir is only 32 km from Miri. Loagan Bunut, which centres on Sarawak’s largest natural lake, is one of the most unusual aquatic ecosystems in Malaysia. The lake normally covers an area of approximately 65 hectares. However when the water level in the adjacent Tinjar river is low, the shallow lake can drain completely, leaving a huge expanse of dried and cracked mud. This normally occurs two to four times a year, in February and in late May or early June/July. This unique cycle of flood and drought has created a remarkable food chain which supports a large variety of aquatic and terrestrial animals. Loagan Bunut is approximately 120km or 3 hours by road from Miri, with half the journey along gravel roads. This park, close to Miri, is the best area in Sarawak for divers with reefs lying at depths from 7 to 30 metres and interesting wreck dives. Year round diving is possible but the best time to dive is from March to August. Mount Murud, Sarawak's tallest mountain (2422m) is located within Pulong Tau National Park, close to the border with Kalimantan. Climbing Mt. Murud entails an arduous four day adventure. The Kelabit Highlands are also in this area. This park is home to Pelagus Rapids. The Wind Cave Nature Reserve near Bau is a popular day trip excursion from Kuching. Fairy Cave is nearby. Read details here. Fairy Cave is an impressive show cave within easy reach of Kuching. For photos, details and directions read here. On the outskirts of Kuching City, Sama Jaya (formerly known as Stutong Protected Forest) is a small urban wilderness and one of the oldest protected areas in Sarawak. 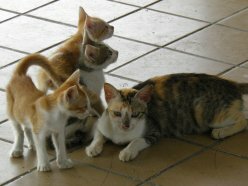 The Semenggoh Wildlife Centre, 24km from Kuching, cares for injured or orphaned wild animals. Its orangutan rehabilitation activities have been transferred to the Matang Wildlife Centre. The Lanjak-Entimau Wildlife Sanctuary (187,000 hectares), together with the adjoining Betung Kerihun National Park (800,000 hectares) in neighbouring Indonesia, make up the most important biodiversity sanctuary in Borneo and, added to the adjoining Batang Ai National Park, may be home to 10% of the remaining wild population of orangutans and other rare and threatened plant and animal species. Gunung Santubong. You can climb this 810m high peak if you have the energy. Expect to take about 5 - 6 hours to go up and down. It is harder than it looks - it is steep and involves scrambling over countless tree roots and a number of rope ladders but climbers are compensated by excellent views, weather permitting. Sarawak Cultural Village at Damai, at the foot of Gunung Santubong, is a living museum where you can encounter all the ethnic groups of Sarawak in one place and experience their culture, dress, traditions, dance and homes. I thought the longhouses and other houses were very interesting. The cultural show is a bit touristy and you can expect to be invited on stage to join the dance or try a blowpipe. They have similar shows in Sabah and elsewhere but well worth experiencing at least once. 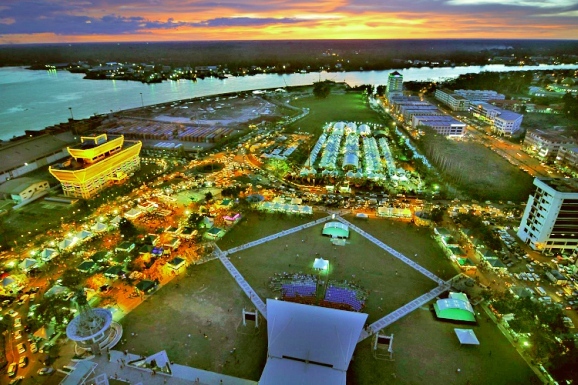 This year's Rainforest World Music Festival was held here. Damai Central. You can read about my trip to Damai Beach and Damai Central here. More Top Sarawak Attractions will be added to this list as I explore further. Looking for places to stay in Sarawak? Take a look at Agoda's website for a wide selection at discounted rates.